Alignment - Plony's Auto Service Ltd. 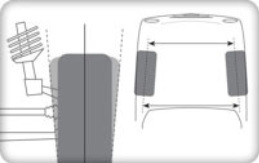 When your wheels are aligned, the wheel angles are corrected to manufacturer guidelines. parallel to each other, as in the diagram. What are the problems caused by misaligned wheels? A vehicle out of alignment wears out its tires faster and burns more fuel per mile. While the most obvious symptom of misaligned wheels is when your vehicle starts pulling to one side, your wheels may be out of alignment even before you notice any problems with handling. What can I expect when I have a wheel alignment performed? Most vehicle manufacturers recommend checking wheel alignment at least once a year. Consult your owner's manual for your vehicle's recommended service intervals.